The global conveyor oven market is gaining from changing food habits in several parts of the world. Globalization, economic liberalization, and proliferation of media in nations such as India coupled with rising disposable incomes have been key factors for the adoption of newer foods, of which baked foods are one. The movement of people because of work opportunities and leisure travel have also created a fancy for new foods such as baked goods. Globally, rising demand for baked goods is primarily driving the global conveyor oven market. The increasing consumption of baked goods such as pizzas, cakes, and cookies have played a major role in the growth of food industry and ancillary industries. For instance, pizzerias display a substantially high demand for conveyor ovens as they help reduce cooking time considerably, which in turn helps attain efficiency and improved customer experience. 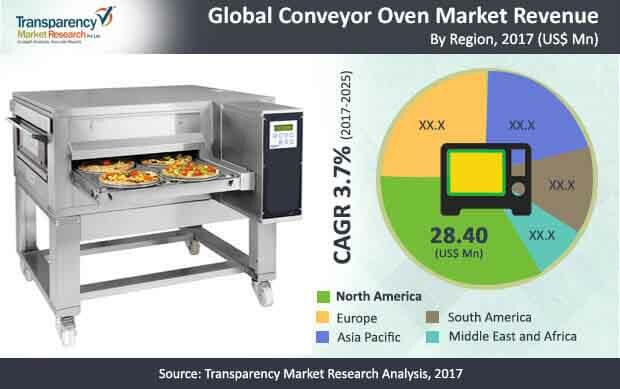 A report by Transparency Market Research projects the global conveyor oven market to rise at a CAGR of 3.7% during the forecast period between 2017 and 2025, for the market to become worth US$123.2 mn by the end of 2025. Based on type, the conveyor oven market is divided into countertop and industrial/heavy. Of the two, industrial/heavy type conveyor oven segment is anticipated to lead the market over the forecast period. The segment is estimated to contribute US$53.2 mn revenue to the overall market by the end of 2025. Rising demand for baked goods and adoption of modern equipment in the commercial food sector for fast and convenient cooking are primary factors for the growth of industrial/heavy type conveyor oven segment. However, countertop type conveyor oven segment are also anticipated to rise at a significant pace between 2017 and 2025. On the basis of power source, electric conveyor oven and gas conveyor oven are the segments into which the global conveyor oven market is divided in this report. In 2016, electric conveyor oven segment held the leading share in the overall market; going forward, electric conveyor oven segment is likely to surpass gas conveyor oven segment over the forecast period. By technology, the global conveyor oven market is divided into convection and radiation. In 2016, convection type oven held the leading share in the global conveyor oven market. However, radiation type oven is likely to surpass in terms of growth rate over the forecast period. Radiation type segment is also likely to surpass convection type technology segment by the end of 2025. By geography, the global conveyor oven market is segmented into: North America, Asia Pacific, Europe, South America, and the Middle East and Africa. North America is currently the leading regional market for conveyor oven due to the increasing adoption of fast and convenient cooking practices in the commercial food segment. In 2016, Europe stood as the second-leading market for conveyor oven in terms of revenue contribution to the overall market; going forward, the region is anticipated to display the leading growth rate in the conveyor oven market over the forecast period. The rising adoption of modern equipment to cook more food in less time in restaurants, bakery, hotels, and food catering services contribute to the growth of European conveyor oven market. Leading players operating in the global conveyor oven market that have been profiled in this report include Middleby Corporation, Lewco Inc., PICARD OVENS INC., Davron Technologies Inc., Star Manufacturing, Wisconsin Oven Corporation, Zanolli, Stoddart International Thermal Systems, Mahan Oven & Engineering Co. Inc., Infratrol LLC, Doyon, Moretti Forni, OEM-ALI Spa, Ovention, Italfornia USA, Lincoln, and XLT Inc. The conveyor oven report provides analysis for the period 2015–2025, wherein the period from 2017 to 2025 is the forecast period and 2016 is the base year. The report covers all the major trends and technologies playing a key role in conveyor oven growth over the forecast period. It also highlights the drivers, restraints, and opportunities expected to influence market’s growth during the said period. The study provides a holistic perspective on the conveyor oven’s growth throughout the above mentioned forecast period in terms of revenue (in US$ Mn), across different geographies, including Asia Pacific, South America, North America, Europe, and Middle East & Africa (MEA). The market overview section of the report demonstrates the market dynamics and trends, such as the drivers, restraints, and opportunities that influence the current nature and future status of this market. An attractiveness analysis has also been provided for every geographic region in the report, in order to give a thorough analysis of the overall competitive scenario of the conveyor oven, globally. Moreover, the report provides an overview of the various strategies of key players present in the market. Product definition and introduction chapter helps in understanding different technologies of conveyor ovens along with their applications which are included in the report. The report segments the global conveyor oven on the basis of technology into convection, and radiation. By power source, the market is segmented into electric and gas conveyor ovens. By type, the market has been classified into countertop ovens, and industrial/heavy ovens. This segment is again sub-segmented into restaurant, bakery, hotels, food processing and other food catering services. Thus, the report provides in-depth cross-segment analysis of the conveyor oven market and classifies it into various levels, thereby providing valuable insights at the macro as well as micro levels. On the basis of country, North American market is divided into The U.S., Canada and Mexico. Similarly, Europe market is divided into The U.K., Germany, France, and Rest of Europe. Asia Pacific has been segmented into China, Japan, India, and Rest of Asia Pacific. Middle East and Africa covers the G.C.C., South Africa and Rest of Middle East and Africa. Similarly, South America region includes Brazil, and Rest of South America. This report provides all the essential information required to understand the conveyor oven and its types. Also, the report provides insights related to the policies and regulations according to the various geographical regions mentioned above. These policies and regulations are directly or indirectly influencing the conveyor oven. Furthermore, Porter’s Five Forces analysis explains the factors which are currently affecting the conveyor oven. This report also provides the value chain analysis for the conveyor oven which explains the participants of the value chain. The report also highlights the competitive landscape of the conveyor oven, thereby positioning all the major players according to their geographic presence and recent key developments. The comprehensive conveyor oven estimates are the result of our in-depth secondary research, primary interviews, and in-house expert panel reviews. These market estimates have been analyzed by taking into account the impact of different economic, and technological factors along with the current market dynamics affecting the conveyor oven’s growth. Middleby Corporation, Lewco, Inc, PICARD OVENS INC, Davron Technologies Inc, Star Manufacturing, Wisconsin Oven Corporation, Zanolli, Stoddart, International Thermal Systems, Mahan Oven & Engineering Co., Inc, Infratrol, LLC, Doyon, Moretti Forni, OEM-ALI Spa, Ovention, ItalforniUSA, Lincoln and XLT, Inc. are some of the major players operating within the global conveyor oven profiled in this study. Details such as business strategies, recent developments, and other such strategic information pertaining to these players have been duly provided as part of company profiling. The conveyor oven market is segmented as below.